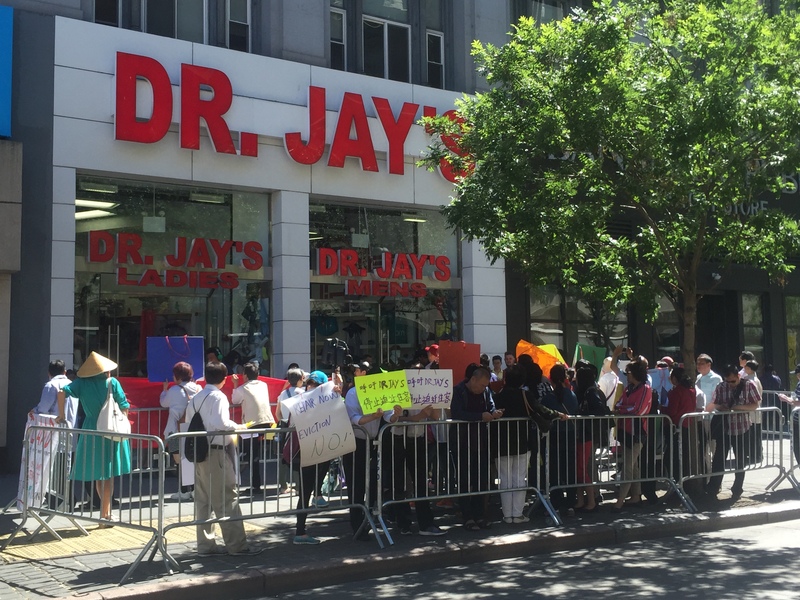 But after a high-profile court hearing between the tenants and their landlord last month (Congresswoman Nydia Velasquez showed up to rail against shady landlord tactics and Public Advocate Leticia James served as co-counsel), the tenants were in an optimistic mood. The hearing quickly yielded talk of a settlement that would provide a stipend for the tenants to move out during repairs and 99-year-leases once they could move back in. But as the tenants’ lawyer Janet Ray Kalson at the time said, “the devil is in the details.” Turns out the details of that settlement are still causing consternation in advance of a settlement conference scheduled for tomorrow. In particular, the tenants believe that their building is supposed to be rent-regulated and want to get the building registered and treated as such. But a lawyer for Betesh, Joseph Goldsmith, argues that the building can’t be rent regulated under any circumstances. But the tenants stubbornly insist on rent regulations. 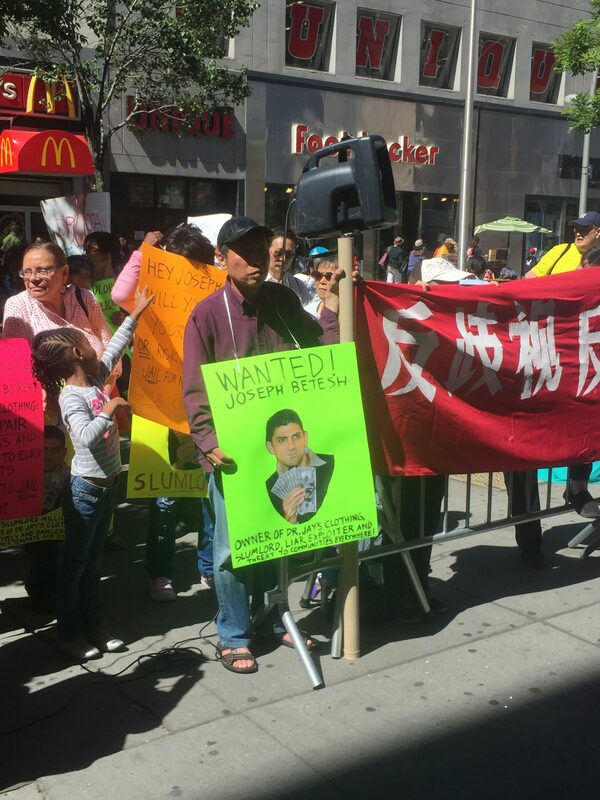 Tenant activists who’ve seen their share of shady landlord tactics (and, perhaps, heard a recent presentation featuring a “guide to evicting rent stabilized tenants“) are wary and don’t want to take any chances. 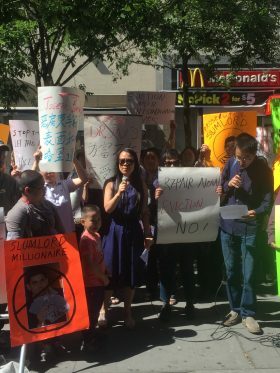 Sarah Ahn, a representative of the Coalition to Protect Chinatown and the Lower East Side, said promises are not enough– tenants want the protections that come along with rent regulation. Another point of contention is the repairs themselves. Both the tenants and Betesh agree repairs need to be made– the tenants have long complained of slanting floors, broken windows and leaking ceilings. The Department of Buildings database showed that the first-floor rear extension at 83 Bowery had deteriorated, with a structurally deficient rotted wooden joist. It also cites failure to maintain plumbing materials and work without a permit in 85 Bowery. The city has ordered the commercial parts of both buildings vacated (the sections that are likely a big part of the attraction to buying a $62 million mainly rent-stabilized tenement in a rapidly-gentrifying area) but not the residential apartments. But do the tenants actually need to vacate in order for the repairs to be made? Engineers hired by each side have conflicting views. The tenants’ engineer found that repairs could be made while they remained living inside. But Goldsmith, Betesh’s lawyer, begs to differ–instead, the landlord’s engineer says that correcting the violations, which will entail removing the staircases, shoring up the buildings and putting in new beams to support the staircases, all need to be done in a vacant building. A settlement conference is scheduled for tomorrow. The tenant’s lawyer, Janet Ray Kalson, declined to comment for this article.